Get affordable Security Camera Installation on Burbank, CA and CCTV equipment with commercial quality and 2 years warranty People do not realize the importance of security until something happen. You have invested a lot of time and resources in building your home or business; you don’t want someone to take part of it. At your home you have value stuff. That is why investing in your family and business security should be your utmost priority. Protection4less will provide you with the best CCTV equipment and professional installation for your peace of mind and protection. 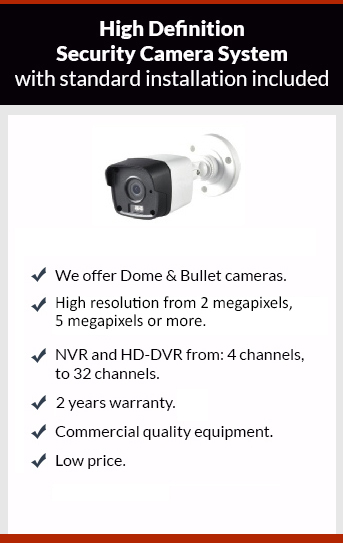 We offer you the latest CCTV technology with state of the art cameras. We offer 2 security camera technologies: IP and TVI. TVI technology can deliver up to 3 megapixels, and IP up to 5 megapixels. All our surveillance systems are viewable remotely through smart phone or computer. If you are on vacation you’ll be sure that you can take a look of your property or your business once in a while. Give us a call we’ll give you the best solution for your security camera needs.